– Aaron Couch of The Hollywood Reporter has a good, long interview with Darkwing Duck creator Tad Stones, which you can read here. Among the revelations? The show wasn’t a spin-off of DuckTales, as instead, it took place in an alternate dimension. And by the way, check out our DuckTales episode here. – The AV Club’s William Hughes spoke to Myst creator Rand Miller on his favorite puzzles, and how that game almost became a Disney ride. Read it here! And listen to our Myst episode here! – In a good interview with MCV’s Alex Calvin, Sega’s European boss Jurgen Post admits that the company was pushing out too much crap during the Wii-era. – From Polygon and other sites, Blizzard’s Chris Metzen is retiring. He was serving as the senior vice president of story and franchise development, and joined the company in the early 1990s as an illustrator and animator. He was responsible for expanding the lore of Warcraft, Diablo and StarCraft. ­– And speaking of Blizzard… One of its low lights, the cancelled Warcraft Adventures, has made its way to the Internet. Check out our show on the actual Warcraft series here. – Did You Know Gaming covers Super Mario World this week, via Nerdist. – Animal Crossing came out today in 2002 in North America. It was yet another blockbuster series established by Nintendo. – Castlevania: Harmony of Dissonance was released on Sept. 16, 2002 for the Gameboy Advance. It was fun! It mixed the classic gameplay with RPG elements. – A Dragon Quest IV remake, Chapters of the Chosen, came out on Sept. 16, 2008. It took the gameplay of the original, but included manual control for the later chapters (yay! ), but also gave everyone weird accents (boo!). New this week is a remake of Dragon Quest VII for the 3DS, which turns it into a much better, playable game, per Attack of the Geek’s Dean James. – FTL: Faster Than Light came out on Sept. 14, 2012. No, it’s not a classic game, but it’s hella good! You definitely need to play it if you like games. Today’s roundup is a day late because Steve has a case of OLYMPIC FEVER. It’s unclear if he contracted it from the waters of Rio, or some other way. Without further ado though, the links! – Anddddd it’s gone. Nintendo Power has been removed from the Internet Archive, per Polygon. – Band of Savers has a very important article posted: “10 Things Duck Tales Taught Me About Money.” And, check out our old episode on the vidya game! – Nintendo Everything has a translation of an interview a Nintendo official did about the NES Classic Edition. Apparently, the save states are going to be more integrated and extensive than originally thought, and there will be several new visual modes for the games. – Fun times, as Entertainment.ie has a screenshot quiz on SNES games. – From Mike Diver at VICE, a Top Ten list of Sonic games. – The AV Club has an insanely long roundtable on the camera in Super Mario 64. – Unsurprisingly, a fan remake of Metroid 2 was quickly taken down, according to Twinfinite. – Kotaku has a look inside Smash Hell, the server where Nintendo banishes spammers and others. – Hint for next week’s show: August 13 marked the 25-year anniversary for a slew of SNES launch games, namely, F-Zero, Pilotwings and Super Mario World. And hey, the SNES itself came out! Good times, good times. – System Shock 2, one of the biggest cult classics ever on the PC, came out on August 11, 1999. It was designed by Ken Levine, and developed by Irrational Games and Looking Glass Studios, but a sequel has been caught in rights snafus for years. 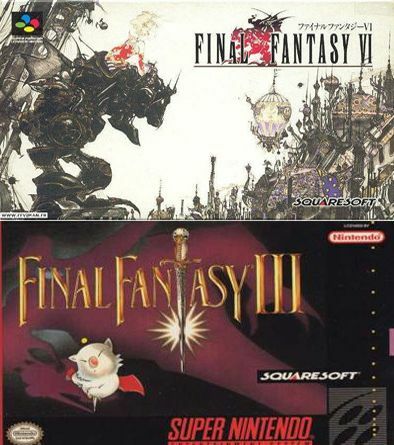 Box art, from FF6 (top) and FF3 (bottom). – Piggybacking on the interest from our last show, clearly, Nintendo has announced that Star Fox Zero will be out this holiday season for the Wii U. Game Informer has an interview with Miyamoto, and like some other interviews from the past month, he says it’s unlikely Star Fox 2 ever gets a proper release. Per most reviews of Nintendo’s E3 performance, they’re paring back on their Wii U offerings, expanding their 3DS array, and not talking about their console-after-Wii. – From CNET, a gamer proposes to his girlfriend by hacking The Legend of Zelda. – Also from CNET and their E3 coverage, Shenmue 3 looks to be a reality after a successful Kickstarter campaign. The series debuted in 1999, and the sequel came out in 2001. – And yet another interesting CNET article, this one from Danny Gallagher on AI programs playing Super Mario World. – Atlus says Persona 5 is still scheduled for a 2015 North American release, despite widespread layoffs at parent company Sega. – From Super Compressor, 14 things in your parents’ basement worth serious money. … Actually, not much happened, unless you have deep, resounding love for games like Cruise Ship Tycoon and Zoo Tycoon Complete Collection, which came out in 2003. The most “significant” game release is probably Neverwinter Nights in 2002. Game history info from Moby Games.